Charles Algernon Fryatt was born on December 2nd,1872, at Southampton. the second son of Charles and Mary. 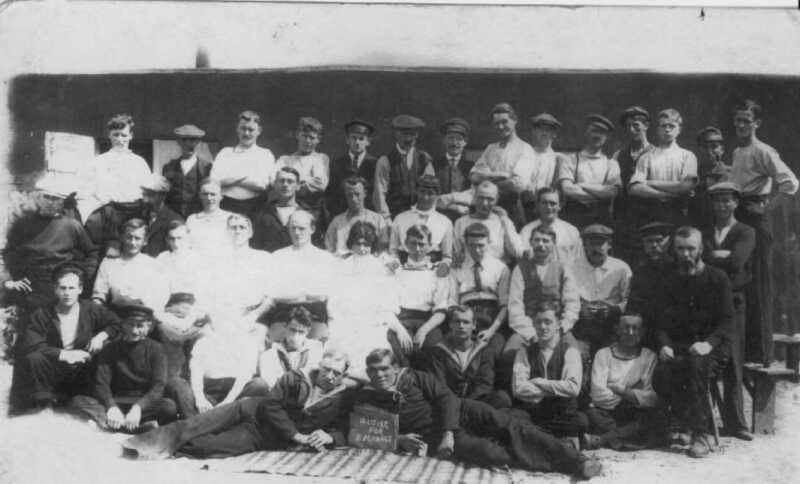 Charles senior held a first mates home trade certificate and after many years travelling the world obtained employment with the Great Eastern Railway at Parkeston Quay. In the 1880s the family moved into one of the company’s new houses In Adelaide Street though it was the corporation school at Harwich where young Charles was educated. On leaving school young Charles followed in his father’s footsteps into a sea going career, He joined the service of the Great Eastern Railway as a seaman on the S. S. ‘Ipswich’ in 1892, thus following the example of his father, who was, before his retirement, a first officer of the G.E.R. steamship ‘Cambridge.’ The G.E.R would often dry dock there vessels at Kingston on Hull, It is Likely Charles met his wife Ethel Towend, they we’re married on the 2nd November 1896 at the parish church of Kingston upon Hull. 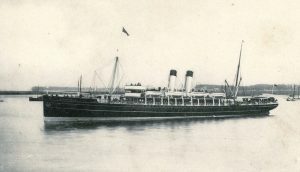 Charles passed through the various grades until he became master first of the S. S. ‘Colchester’ on occasional service between Antwerp and Harwich, and in 1913 of the S. S. ‘Newmarket’ on the Rotterdam-Harwich cargo trade. Since the beginning of the war he had made 143 passages between Harwich or Tilbury and Rotterdam, maintaining, with his colleagues, the route of the G.E.R. Continental service in spite of unlighted coasts, mines, enemy submarines, aircraft and warships. In March, 1915, three attacks were made by submarines upon G.E.R. steamers, the first one upon the s.s. ‘Wrexham’ the last upon the s.s. ‘Brussels,’ Captain Fryatt being in command on these occasions. The second attack was upon the s.s. ‘Colchester’ As a result of these attacks the famous watches were presented. On March 2nd, 1915, about noon, near the Schouwen Bank, the ‘Wrexham,’ proceeding to Rotterdam, was chased for 40 miles by an enemy submarine. Deck hands assisted the firemen to get every ounce of speed, and the enemy’s signal to stop was ignored. They made sixteen knots out of a boat which could hardly be expected to do fourteen knots, and dodging shoals and floating mines, as well as the submarine, Captain Fryatt got his boat safely into Dutch waters. She entered Rotterdam with funnels burnt and blistered, the crew black with coal-dust. The master reported that had it not been for the good work put in by the engineers and the men firing he could not have escaped;but his own pluck and skill was recognised by the Company in the presentation of a watch. The Consul – General at Rotterdam reported after interrogating the Captain and First Officer that the master, the officers, the engineers and the crew were worthy of the highest commendation for their action. The Lords Commissioners of the Admiralty informed the Company they considered that the conduct of the master, officers and crew of the vessel, and especially of the engine-room complement, showed spirit and was creditable to them. The enemy would no doubt argue from these commendations a direct instigation on the part of the British Government to the destruction of helpless German submarines. At that time, however, German sea warfare made it clear to British seamen that their lives depended upon the ship’s speed or the chance of destroying the enemy ship. The greatest instigation to the destruction of German submarines by merchant shipping when attacked (the only conceivable circumstance in which a merchant vessel would attempt to destroy a war was that declaration of the German Government in February, 1915, that merchant ships in the waters round Great Britain and Ireland might be destroyed without warning,and the acts that confirmed it. On the afternoon of Sunday, March 28th, the SS. ‘Brussels,’ near the Maas L.V., on way to Rotterdam, sighted a German submarine at a distance of four miles steering southward, which then turned towards them very fast. Captain Fryatt said it was no use trying to get away as he could have been easily torpedoed on his course and the speed of the submarine was far greater than that of the ‘Brussels.’ The submarine hoisted two flags for him to stop but, he stated, he did not like to give up his ship. He then, to save the lives and property under his care, took the splendid decision to ram the submarine if possible. For that decision he has been murdered; for that decision his name is honored throughout the British Empire. He sent down the engineers to get all possible speed; ordered the crew aft out of the way in case the ship was fired at; got the chief officer to fire off three socket rockets to make the enemy believe he had a gun and steered straight for the conning tower of the submarine, then not far away. The latter, seeing his signals ignored and hearing the rockets, immediately submerged. Captain Fryatt steered straight for the spot where the submersion took place and when he thought he was on top of the enemy saw his periscope come up just alongside. He then gave the order to sweep over the periscope and I have heard this order was slightly anticipated, the wheel being moved first. The safety of the ship of course depended upon keeping the submarine down . The Captain did not feel the ship striking the submarine, but one fireman reported a bumping sensation under the bottom of the ship. The submarine, the U 33 was one of the large type then coming out and must have had a remarkable escape. Captain Fryatt thought he must have damaged or sunk it as he considered it was impossible for it to get clear according to the position of its periscope when it came to the surface. After it passed the Brussel’s bridge it came further out of the water showing a decided list, after which it disappeared. Although a good look-out was kept, nothing further was seen of it. The master thought the submarine to be quite 300 ft. long, very high bow and very large circular conning tower, and she had no distinguishing marks.The submarine chased the ‘Brussels’ for twenty minutes and the latter ship made the very good speed of 15½ knots. The Germans swarmed aboard Brussels with revolvers and bombs in their hands, rounding up the officers and ratings. A German flag was hoisted and the boarders steamed the ship to Zeebrugge. The ship berthed in Zeebrugge for six hours awaiting tide for the steamer to sail up the canal to Bruges. On arrival at Bruges the crew were imprisoned at Ruhleben, Brandenburg, and Bruges, being moved around from time to time before being released at the end of the war. Captain Fryatt and William Hartnell were taken from Bruges to Ruhleben on 2nd July 1916 where they commenced three weeks of severe interrogation. Those true details of the attacks of March 2nd and 28th, 1915, amply illustrate that Captain Fryatt was worthy of the honor in which his name is now held. The narratives require to be read with consideration and imagination for proper appreciation. In the second case, the quick resolution, the bluff of the rockets, the cool observation of the enemy, and the calmness and quickness of the crew, all showed what kind of men these North Seamen of the British race are. One wonders whether that submarine actually escaped. The ship’s bottom showed no signs of contact. Witnesses from her are alleged to have appeared at the mock trial. Yet it is just as likely as not the only evidence the Germans possessed was the uncensored reports that appeared in Dutch and British papers. Although G.E.R. steamers have had narrow escapes since, it is curious Captain Fryatt was not again attacked until he was captured by a concerted coup – over a year later. On the night, June 22/23, 1916 with refugees on board and cargo of foodstuffs, the ‘Brussels’ left the Hook of Holland. Two days later she was heard of as captured and taken into Zeebrugge. 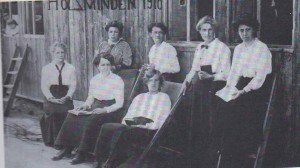 After a time postcards were received in Harwich from the ship’s staff at Ruhleben; one came from the captain at the same place; and finally cards came from the stewardesses at Holzminden, near Hanover. All reported themselves well but in need of parcels. The last news received by his wife from Captain Fryatt was sent from Ruhleben, July 1st and reached her July 29th the morning after his death at Bruges. 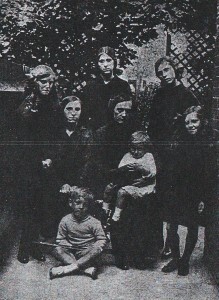 Various reports have appeared as to the fate of the Belgian refugees. On 27th July 1916 Charles Algernon Fryatt stood before a court charged as follows: “Although he was not a member of combat force, he made an attempt, on 28th March 1915, to ram the German submarine U33 near the Maas Lightship”, Had Captain Fryatt either during interrogation or at his trail stated he was acting under Admiralty instructions in heading for an enemy submarine with the view to escaping, the court would not have condemned him, the German code giving protection to an enemy in these circumstances. All the Captain would say was “I have done nothing wrong”. At 1600 the court found the Captain guilty and sentenced him to be shot. Two hours later the prisoner was taken from his cell to the yard, tied to a post, and shot. The Germans took the ship and the prisoners back to Zeebrugge, a Belgian port they controlled. Apparently they enjoyed an elaborate meal on the way, but the English stewardesses pretended not to have any wine on board. Brussels stayed at Zeebrugge for five hours and was then taken to Bruges. The crew of 40 men and five stewardesses were locked up together in a cell at Bruges town hall; they were given only bread and maggoty soup to eat. The stewardesses were put in a cattle train and taken to Ghent, where they spent another night in a slimy cellar. They were taken to Cologne and eventually to a camp at Holzminden, from where they returned to the border of neutral Holland. The men were less fortunate. They were taken from Bruges to Ruhleben, from where they were Scattered to several camps. Fryatt and first officer Hartnell were taken back to Bruges, where they were questioned. The judge was an army man, the jury were naval men and the interpreter was the commander in charge of the flotilla which stopped us. “After the trial was over we heard the captain would be sentenced at 5 p.m. on the same day, Fryatt was found guilty and sentenced to death. Hartnell was told that it was Fryatt’s last night and they he should stay with him, but at 6.30 pm it was announced that Fryatt was to be shot that Evening. At 7 pm Fryatt was taken out and shot, receiving 16 bullet wounds. In Britain the news of the trial and sentence aroused a storm of protest. In Parliament there were demands for those responsible for his murder to be brought to justice when the war ended. The imperial Merchant Service Guild called it the most despicable crime yet perpetrated by Germany. It was indeed a pleasure and a relief to see again the released stewardesses of the s.s. ‘Brussels.’ Mrs. Elwood, Miss Elwood, Mrs. Stalker, Miss Bobby and Miss Smith have passed through a most trying experience and have done so in a manner of which G.E.R. women can be proud. The Germans who boarded the ‘Brussels’ wondered at their calmness and asked if they were not afraid of being shot. ‘We are Englishwomen’ was considered sufficient reply. The Stewardesses wore their blue uniform with brass buttons and Germans took them for fighting women: England’s last hope, taken in a great fight for H.M.S. ‘Brussels.’ Some Finnish sailors deprived themselves of food to aid them and they also received help from a French Committee. Without this early aid and the parcels subsequently received from the Company and the Red Cross they could hardly have endured. 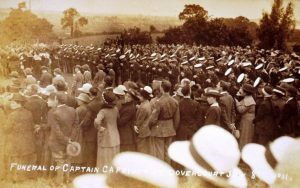 At the camp they learnt with great grief of Captain Fryatt’s death. They could not communicate with the crew at Ruhleben. Scarcely could they believe their good fortune when released and hurried to the frontier station – their baggage was not examined, a most unusual circumstance. But they passed from Germany in dignity. The Germans renamed Brussels Brugge and used her as a submarine depot ship. Under threat of a British invasion the ship was internally mined at the entrance to Zeebrugge harbour to protect the submarine base. The Great Eastern Railway were paid £51,000 by the insurers of Brussels. 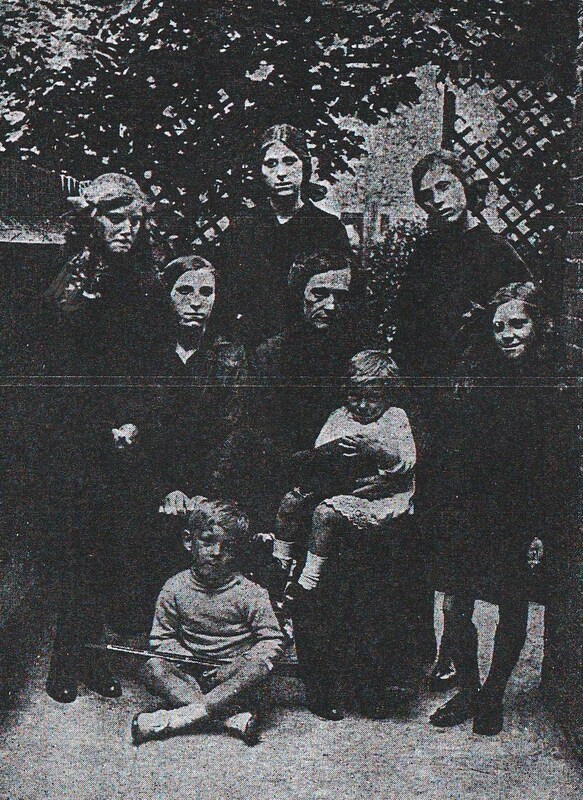 Captain Fryatt who lived at 55 Oakland Road, Dovercourt, left a widow and seven children. Olive, 18; Victoria, 16; Doris, 14; Vera, 11; Mable, 10; Charlie, 5 and Dorothy 2. There was great sympathy – the Royal Merchant Seamen’s Orphanage offered to educate and care for two of the children, and other offers were made of generous sums. There was, however, no need to take advantage of those offers. The Great Eastern Railway awarded Fryatt’s widow a pension of £250 per annum. The Government granted her an extra £100 per annum pension on top of her entitlement. Fryatt’s insurers, the Provident Clerk’s Association, paid the £300 that Mrs Fryatt was entitled to immediately, dispensing with the usual formalities. The Royal Merchant Seaman’s Orphanage offered to educate two of Fryatt’s seven children. The King expressed his indignation and abhorrence at the execution of Fryatt in a letter to Mrs Fryatt. The wreck was raised and handed back to the British Government, who sold the ship at auction for £31,000, donating the money to a charity to commemorate Charles Fryatt. 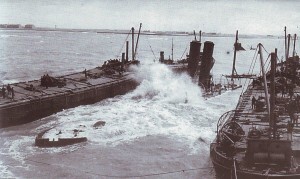 The wreck was towed to Leith, where she was repaired and converted to a cattle carrier, under her new name Lady Brussels the ship made her last crossing from Dublin to Liverpool on 19th April 1929 before being broken up at Port Glasgow the following month.the Fryatt Family and the British Government wanted Fryatt’s body returned home. In the presence of William Fryatt, brother of the deceased, and William Hartnell, in the quiet graveyard at Bruges grave diggers set to work and raised coffin number 29. Fryatt’s body was bought from Belgium to Dover on the destroyer ‘Orpheus’ on July 7th 1919. It was then taken by train to Charing Cross where it was placed on a gun carriage and drawn by blue jackets, accompanied by a naval band, to a service in St. Paul’s Cathedral. The body was then taken to Liverpool Street Station where the Great Eastern Massed Bands were playing funeral music. After the service in St Paul’s the procession was re-formed to Liverpool Street where a special train was waiting to bring the hero to his own home. 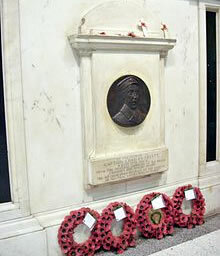 At many stations down the line reverent crowds assembled to pay their last respects to one of England’s brave men. Thousands of people lined the route from Dovercourt Station by way of Kingsway, Marine parade and Fronks road to the churchyard. On Marine Parade, some 1500 school children under the care Of their masters and mistresses lined the route. Special Constables assisted regular and reinforced police to keep the route clear. The great procession headed by the regular and special police and the Shotley Band, included representatives of the Friendly Societies and Masons. 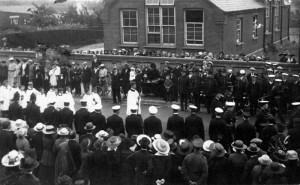 There was also in the Procession, the Mayor and Corporation, Major H K Newton MP, Lord Claud Hamilton and other officials ,members of the RGA, Air force and RAMC,members of the ships stationed in the harbour and the Royal Marines, the boys from the naval training establishment at Shotley, members from all departments of the GER and reps from every organisation in Dovercourt. Immedialty in preceding the coffin was the lord’s bishops of Chelmsford, Colchester and Barking. 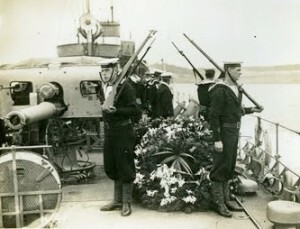 The Salvation Army and Naval bands played funeral music on the route. The local clergy and ministers and massed choir joined the cortege at Upper Dovercourt. At the graveside there was a never to be forgotten scene, Thousands of people reverently participating in the final act of homage to the hero and manifesting Sympathy with the widow, who joined the cortege at Dovercourt and her 7 fatherless children. The second portion of the funeral was carried out at the graveside by the Rev T Grey Collier, vicar of Dovercourt, the Bishop of Colchester and the Bishop of Barking. After singing the hymn “Eternal Father, strong to save” the coffin was lowered into a grave lined with evergreens and flowers. The Bishop of Chelmsford addressed the vast gathering. He said, today we are honouring the homecoming to the beloved England of the grey North Sea, where his work was done. In doing honour to him, we do honour all men who, in times of peace, went down to the sea in ships and who occupied their business in great waters; who in times of war held not their lives dear to the death but by countless deeds of heroic combat restored that freedom for the security of the peaceful commerce of the world and the quietness and safety of their island home. 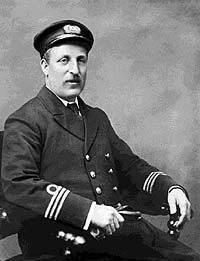 Captain Fryatt fought the menace of the deep and having done his duty nobly, fell a victim to ignoble spite. In the shooting of this brave man; Germany sounded the lowest depths of her national ignominy. That remains the fouled blot on a dark record which will forever shame her future generations. But we today lay his body to its last resting place with thankful hearts – thankful for his devotion to duty, thankful for the brave spirit which animated him to the end, and, above all, thankful that the great cause for which he fought has proved victorious by the blessing of God. But our thankfulness must manifest itself in renewed devotion to duty increasing desire to use the opportunities which victory has given us, to the full. We must be patriots each and all of us. So today we leave the body of Captain Fryatt. His name will live in History and will be to thousands, yet unborn, an inspiration. The Great Eastern Railway awarded Fryatt’s widow a life pension of £250 per year, The mayor of Harwich opened a memorial fund and a Fryatt memorial was put up in the booking hall at Liverpool street in 1917. 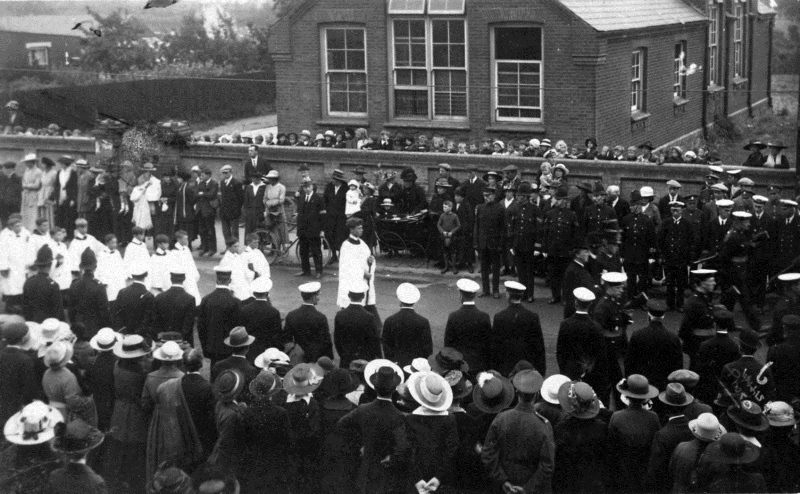 On 19th Aprill 1922 Lord Claud Hamilton, Chairman of the G.E.R, officially opended the Fryatt Memorial Hospital having been given a silver key by 11 year old Charles Fryatt, only son of Captain Fryatt. To the Memory of Capt. Charles Fryatt, July 27th 1916. From the neutral admirers of his brave conduct and heroic death. The murder of Charles Fryatt was condemned across the civilized world and, as history has shown, the merchant seamen of the Allied Nations refused to be so intimidated; they carried on their dangerous but vital role through to the end of the war. To the memory of Captain Charles Fryatt July 27th 1916 from the neutral admirers of his brave conduct and heroic death. The Mayor of Harwich issued a circular as follows:- Guildhall, Harwich, 2nd August, 1916. As Mayor or of the borough I have decided to open a fund to commemorate in history the dastardly shooting by the German Government of Captain A. C. Fryatt of the ss ‘Brussels’. The money subscribed will take the form of a lasting memorial, which will be decided upon by an influential committee, the family already being well provided for by the Government and the Great Eastern Railway Company. Any subscriptions sent will be duly acknowledged and paid into a special account and properly audited. In connection with this, traders connected with the route, including those of neutral nations (a public subscription for all Dutchmen has been proposed by a prominent citizen of Holland), have expressed their desire to subscribe towards something of this nature, and a suggestion has been made that the most appropriate idea would be a fund to aid the families of seamen lost at sea or the increase of life-saving apparatus on the coasts of Eastern England and Holland. Possibly there are families in financial distress through German submarine warfare: if so it would seem suitable for funds in the name of Captain Fryatt to be put to their aid. The picturesque churchyard at All Saints Church, the memorial which stands at the bottom of the main walk way, a position which overlooks the harbour, from which the late Captain was once to sail, and also overlooking the historic old church and churchyard where many Great Eastern steamship men have been buried. After the dedication by the Rev. T. Grey Collier and a prayer, the vast audience joined in the singing of the hymn ‘O God, our Help in ages past,’ and the Blessing, followed by the singing of the National Anthem, terminated an historic and excellently arranged ceremony. Surrounding the inscription is an interwined ropework of handsome character, and the top is surmounted by the badge of the Mercantile Marine, whilst underneath the inscription is a wreath of laurel leaves with the words ‘Pro Patria’ in the centre. 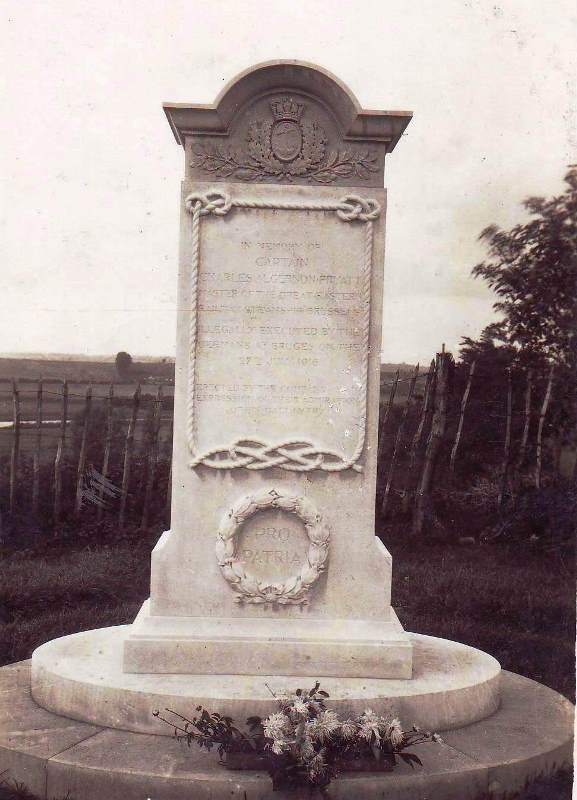 The inscription reads:- ‘In memory of Captain Charles Algernon Fryatt, Master of the Great Eastern Steamship, Brussels, illegally executed by the Germans at Bruges on the 27th July, 1916. His name will live in History and will be to thousands, yet unborn, an inspiration which will never die.